Years ago I was introduced to an inexpensive astringent known as witch hazel. There’s always a bottle in my medicine cabinet and I use it daily as a skin freshener and morning eye opener. Native Americans discovered hundreds of years ago that it was an effective treatment to soothe swelling and even tumors. The astringent comes from the witch hazel shrub; Native Americans boiled the stems to extract the witch hazel. Early American settlers learned to use it from Native Americans, and today, we are finding new uses. It’s very inexpensive – I pick it up at Fred’s for about $1.75 a bottle and it is as effective as the pricey designer products which do the same thing. Sunburn care. Apply witch hazel to a wash cloth and gently pat on your skin. Witch hazel will help soothe the burn and prevent peeling. Acne fighter. Rub gently on your face over problem acne areas. Witch hazel is non-drying, making it a better acne fighter than some remedies found in the drug store specifically targeting acne. Psoriasis and eczema fighter. Witch hazel helps reduce the pain and itching associated with these conditions as well as the visible patches of psoriasis and eczema. Poison ivy treatment. Because of witch hazel’s ability to reduce pain and itching, it is also perfectly suited for treating poison ivy. Eye redness and swelling reducer. If you have been crying or simply have puffiness under your eyes from lack of sleep or illness, put a washcloth in a mix of witch hazel and water, ring out, and gently place on your closed eyes for 10 minutes. Insect bite soother. Simply put a little witch hazel on a cotton ball and put on the bite for instant relief and reduction of the accompanying swelling. Itchy scalp. After hair coloring and daily blow drying, it is no wonder our scalps get dry and itchy. Treat the itchiness with one part witch hazel to two parts water. Massage through hair and rinse. Bruising and swelling reducer. Because witch hazel has anti-inflammatory properties, it is a good treatment to reduce bruising and swelling. Childbirth injury reducer. 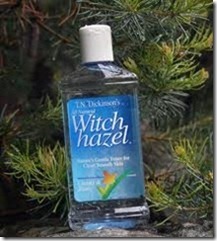 Many women, especially those who work with midwives, are told to buy witch hazel before giving birth. Witch hazel can be used to treat hemorrhoids and to relieve the pain of a vaginal tear from delivery. Household cleaner. Witch hazel can also be combined with lemon juice and baking soda to create an eco-friendly cleaning agent for your bathrooms. Jewelry cleaner. Dab some witch hazel on a cotton ball to gently clean your jewelry. This entry was posted in Good housekeeping and tagged Frugal beauty secrets, Homemade skin freshener, Witch Hazel skin care by Emily Jones. Bookmark the permalink. I’ll do it Martha. Thanks for tuning in. I buy Bragg cider vineger with the “mother”. Wonder if that’s the same company. Did you authorize this reposting: http://pventura.introtowp.com/saving-on-beauty/ ? I see a lot of your article reposted there with no credit given to you. You’ve spent a day in the woods or a day doing yard work when you brush against the leaves of a poison ivy or poison oak plant. Or maybe you didn’t notice the plants, but you’ve developed a streaky rash with red bumps that turn into weeping blisters. You can treat the itchy allergic reaction that comes from exposure to poison ivy and poison oak resins with either drugstore remedies, home remedies or prescriptions corticosteroids. The rash may last from 1 to 3 weeks, but the symptoms usually peak between the fourth and seventh days…,:..